The "authentic" India can only be experienced in the rural areas. I had very little time to visit these areas. The photos taken here were shot a couple of hours outside of Bangalore. 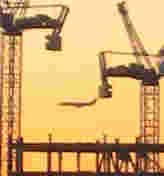 This was taken from a moving car -- hence the odd angle. A woman is doing the family laundry in an irrigation ditch alongside a rice field. I saw dozens of people doing laundry in this way -- at nearly every irrigation ditch. This coconut vendor was one of dozens we saw along the roadside. 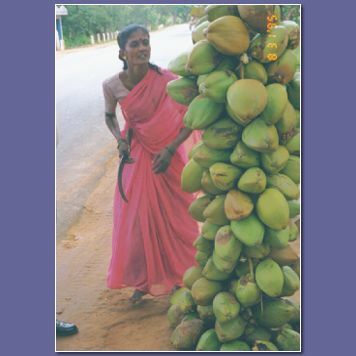 They all looked just like this one -- a barefoot woman, with a huge stalk of coconuts, and a very sharp knife. For a couple of rupees (less than 1 US penny) she would give you a coconut, cut some holes in it and place a plastic straw in it. The coconuts were not fully ripe, thus the liquid was almost clear, not the whitish liquid we are accustomed to seeing. This was a tasty and refreshing snack -- much better than drinking Coke or Pepsi. Cattle may be worshipped and not eaten, yet they are certainly put to work. 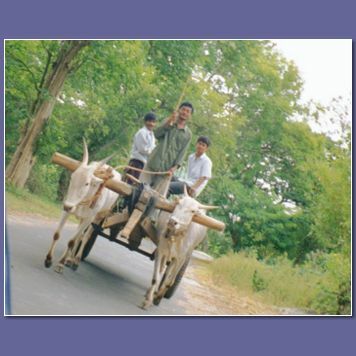 In the rural areas the most common vehicles are bicycles and bullock carts. 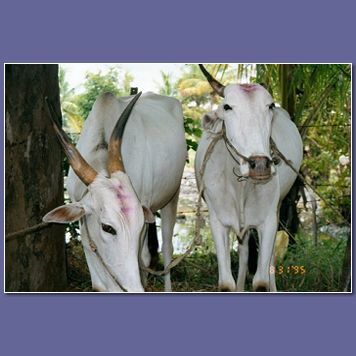 These bullocks have recently been blessed in a Hindu temple. They still have the mark on their foreheads.